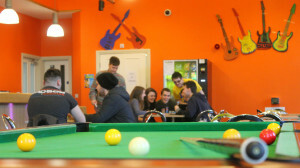 The café is a great place to catch up with friends in a friendly and welcoming environment! There is a pool table, comfy chairs, free WiFi, a range of hot and cold drinks and food to choose from, and also plenty of plugs and sockets to charge your phones! We hold regular disco’s here and we even hire the café out if you want to organise your own Birthday Party or Junior Prom!